More than a simple "Hello," send through the mail, postcards — without a single written word — can help us define our social history. The images captured in postcards show us what was seen as important to an area in a specific moment in time: locations, events, businesses. Over time, they show the urbanization of towns, changes in architectural styles, in fashion styles, in modes of transportation, and countless other subtle changes. In this way, postcards act as an invaluable source of local history. Over the years, the library has amassed a large collection of Wheeling-related postcards. These documents give a glimpse into our past and help tell the visual tale of our city's rich heritage. A substantial collection of Wheeling postcards was donated to the library by Mrs. Neva Wagener Colbert in May of 2014. 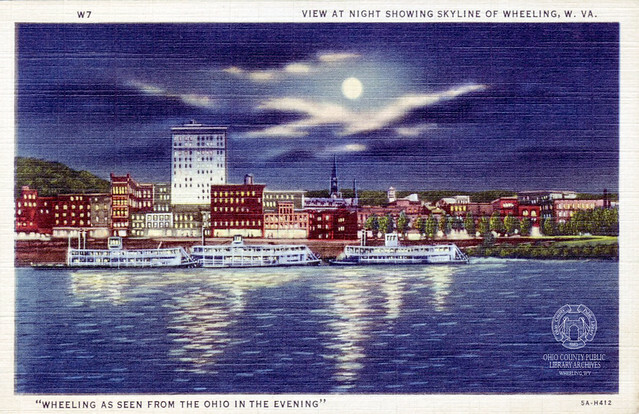 In a letter sent along with the postcards, Mrs. Colbert wrote, "My husband and I had a lot of fun collecting these postcards of Wheeling, my home town. I tried to find pictures of Wheeling as I remembered it from the years of my residence ther (1937-1960). Now I hope patrons of the library find fun and information in them. Sincerely, Neva Wagener Colbert."